Driven by new regulations for energy efficiency, the world of HVAC has been rife with innovation and new advancements in recent years. Newer HVAC systems are designed for efficiency. The new, cutting-edge commercial HVAC systems are also helping HVAC companies in the UK increase productivity and improve client retention. From Eco-friendly HVAC to high tech add-ons, here are 5 cool advancements in commercial HVAC. 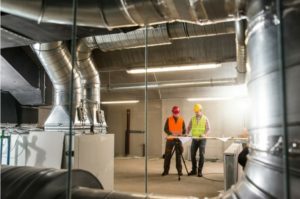 Thanks to up-and-coming technological advancements in the world of commercial heating, owners of commercial buildings can make their properties more comfortable without posing risks to the environment. The use of energy analysis software, for instance, has led to the emergence of more energy-efficient, cost-saving HVAC systems in the UK. Smart controls, such as smart thermostats, are making new generation HVAC systems easier to manage. You can adjust the HVAC system on a whim, and program the building’s preferred heating and cooling schedule into the smart device. Smart controls help save energy while keeping commercial buildings perfectly comfortable for everyone. Older HVAC systems can get quite loud during operations, which can be very distracting in a work environment. New generation HVAC units are designed to be remarkably quiet even when operating at full speed. Investing in a new HVAC system is a great way to maintain peace and a quiet in a commercial building and reduce distraction from HVAC noise. Outdoor air conditioning units often get corroded and have to be replaced sooner than they should be. This is especially true for buildings in coastal towns. Thanks to advancements in HVAC technology, newer units now come with corrosion protection. As a building owner, you don’t have to deal with the stress of having to repair or replace a commercial heating system due to corrosion. Newer commercial HVAC systems come with air quality add-ons to ensure that indoor air is clean and healthy. Older models can’t quite keep the building’s air quality as clean as newer units can. These units also come with enhanced dehumidification capabilities for better humidity control in a building. ST Heating Services Ltd is committed to providing high-quality commercial heating and plumbing services in the North West, UK. We always try to stay on top of developments and emerging trends in HVAC technology and use this information to provide reliable comfort in your facility or office building. Give us a call on 0161 279 0137 or email info@stheatingservices.co.uk if you need an industrial and commercial boiler, heating & plumbing servicing, repair & maintenance in Manchester and throughout the North West, UK.